This year I ordered over half of my Christmas gifts from Amazon. I kept watch on their lightning deals and gold box offers where I could get some great deals. They also offer outstanding customer service and shipping. I ordered several gifts on Dec. 22 around 6 pm and had them the next day for only $3.99 shipping since I am an Amazon Prime member . However, two-day shipping is always free for Amazon Prime members! 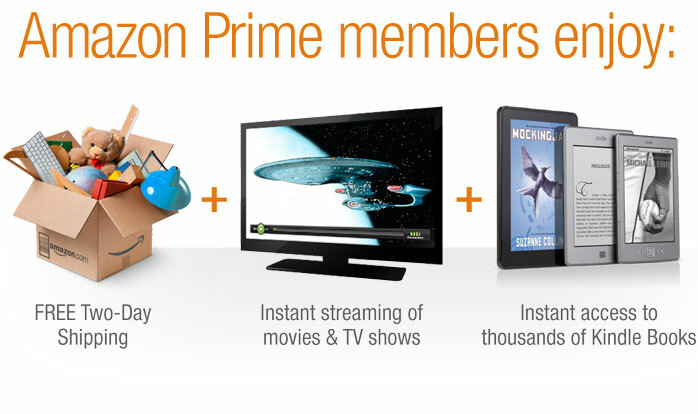 In 2011, Prime members benefits also include digital videos and Kindle books. Prime Instant Videos gives Prime members instant access to thousands of popular movies and TV shows. Prime Instant Videos are available for instant streaming on the Kindle Fire, as well as PC, Mac, Roku, and hundreds of TVs and Blu-ray players. Another benefit is the Kindle Owners’ Lending Library, where Kindle owners can borrow and read thousands of books for free, with no due dates. The library has grown to over 50,000 titles and includes more than 100 current and former New York Times Bestsellers such as the Hunger Games trilogy, The 7 Habits of Highly Effective People, and Moneyball. If you haven’t tried Amazon Prime yet, sign up for a free one-month trial today and join the millions of people who are already members.